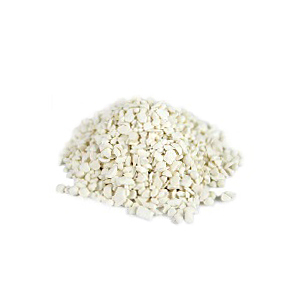 Corosex media can be mixed with Calcium Carbonate media for neutralizing low pH water. It can treat water with pH being as low as 5.3 . Upflow systems are recommended unless the water already contains hardness. A minimum of 50% mix of calcite, or higher concentration is recommended to prevent cementing. How it works. By neutralizing free carbon dioxide in water, Corosex media can correct "red water" conditions and prevent corrosion. The media is a magnesium oxide. Corosex is best when combined with calcium (calcite). Media is slowly dissolved , so replenishment will be required. A gravel support bed is recommended in standard vertical tanks. Best mixing combinations with Calcite are: 90% Calcite 10% Corosex , or 80% Calcite 20% Corosex. 50/50 mix is also possible. Density: 100 lbs / cu.ft.